May 10, 2016 is not Jess and Nick’s big day. It’s Schmidt and Cece’s wedding day, the culmination of a season-long arc involving parental reconciliations, the reinforcement of friendships, and one eventful desert road trip. Suddenly switching gears and punctuating “Landing Gear” with a Jess-and-Nick reunion would trivialize so much of what came before it this season. 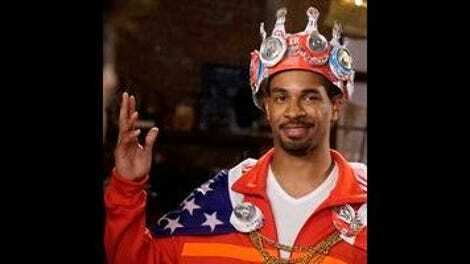 And besides: The New Girl writing staff needs to leave itself something for season six. But the fact that I found myself hoping Jess and Nick might kiss and make up speaks to how far New Girl has come in five seasons. In 2011, I worried the show would force a will-they/won’t-they relationship on the roommates, because that’s what sitcoms like New Girl do. Instead, this sitcom let its characters develop independently, then explored how they might complement and complete each other. That process involved some hiccups with Schmidt and Cece, but it all led to a pair of lovely episodes in “Wedding Eve” and “Landing Gear.” And it led to the most epic game of True American to date, and for that we should all be thankful. Like “Road Trip” and “A Chill Day In,” tonight’s episodes are two sturdy halves of a standout whole. One’s a little more utilitarian than the other, but it’s highs are so high, you’d barely notice. 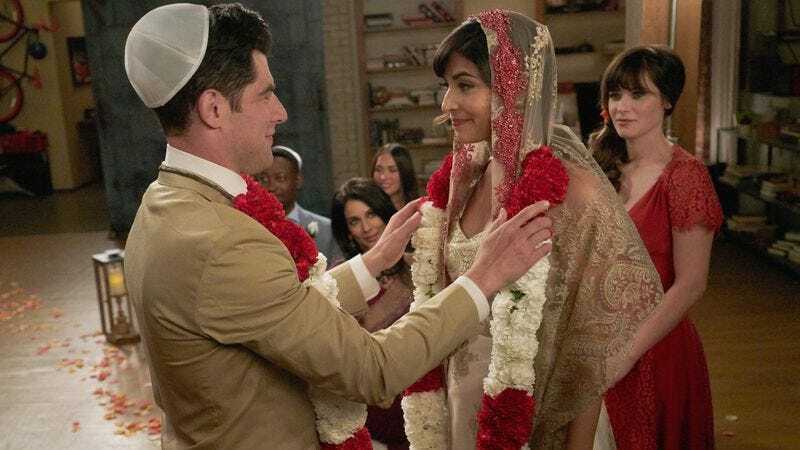 “Wedding Eve” is a great big inhalation prior to the May-sweeps spectacle of “Landing Gear,” a time to quietly conclude the ongoing storylines that have no bearing on the Schmidt-Parekh nuptials. Not that it abstains from sweeps staples entirely: Sam dumps Jess, Winston and Aly say “I love you” for the first time, and who’s that at the door? Why it’s special guest stars Damon Wayans Jr., Nora Dunn, and Kim Wayans—the last two of whom are now engaged, sticking yet another save-the-date to the loft fridge. But there’s such careful character work throughout, the heavy-lifting didn’t fully register with me until after the fact. It’s a divide-and-conquer deal like the bachelor/bachelorette two-parter: Winston’s in a panic about telling Aly she’d make a beautiful bride, a personal crisis that bobs and weaves through the guys’ attempt to rewrite Schmidt’s wedding vows. Sure, Winston’s still married (which even Reagan has heard about by now), but the way he’s clicked with Aly puts some emotional “oomph” into this storyline. Lamorne Morris has been the secret MVP of season five, and that continues through “Wedding Eve,” as Winston seeks Coach’s advice about breaking out of the “sweetie pie” box. And we don’t even get to see Winston’s best material of the night: Like Jess’ detailed explanation of the True American rules, Winnie The Bish’s winning rehearsal-dinner toast about honor, integrity, and the gig economy is merely alluded to. That type of decision wisely keeps “Wedding Eve” on the small, intimate side—True American (First Ladies Edition) aside. It’s the quiet (again, that beautifully noisy, hilariously incomprehensible True American sequence aside) prelude to the grand gestures, video-chat-assisted hijinks, and even bigger guest stars of “Landing Gear.” As Elizabeth Meriwether discussed in our pre-finale interview, the challenge here was not repeating Cece’s previous wedding, which first and foremost means going through with the thing. But “Landing Gear” inverts “Elaine’s Big Day” in other ways, like Winston’s scrubbed wedding-day prank and Nick riding into the sunset with someone who’s not Jess. And when Schmidt finally gets off that damn plane, the show puts together quite the little wedding video for him and Cece. The ceremony is a perfectly dreamlike sequence, cut together in a way that unsticks the couple in time as they declare their love in front of family and friends. The sound mix evokes the head rush of such an emotional milestone, as the dialogue embroiders Seinabo Sey’s “Still.” [UPDATE: So the dialogue’s much more audible in the final cut than it is in the screener version of “Landing Gear.” I still like the general time-hopping quality of the scene, though.] Steeped in the characters’ bond, it retains the show’s sense of humor, too: Cece’s vows include something about the “constant mispronunciation of common words.” The best parts of season five have developed the show’s relationships while honoring its past, and the wedding ceremony is no different. No past on New Girl is as rich or ripe for delving into as the one shared by Jess and Nick, so “Wedding Eve” and “Landing Gear” are smart to merely dip their toes in. “Wedding Eve” goes for the “Cooler” echoes—True American, but specifically Jess and Sam behind the iron curtain—while “Landing Gear” goes into detail about Jess’ feelings for Nick. You can hear Meriwether’s love for these characters speaking through Jess when she tells Nick “I’m tired of you being the only person who doesn’t see how incredible you are”—a refutation of Nick’s self-deprecating default, along with the notion that he’s grown and matured in recent seasons because he had to. They’ve had their differences, but Jess has always seen the good, lovable person Nick is at his core. After being sidelined for so much of season five (and then sidetracked with the Sam storyline), it feels like Zooey Deschanel is finally off the bench this week. She’s emotional dynamite in this scene, as well as the elevator break-up with Sam. But it’s not about just Jess or Nick or Winston or Cece or Schmidt. The conclusion of season five is about all of them, about how the celebration doesn’t truly begin until Schmidt’s off the plane, or how the True American roster is incomplete until Coach shows up to be crowned the True American. That’s why everything eventually comes back to the loft, where the most important moments of tonight’s episodes take place: The break-up, the wedding ceremony, Nick and Jess’ final scene, the introduction of True American’s “JFK cheated, Jackie redecorates the White House, and everyone drinks (even John John)” rule. After all this time, the loft is the most tangible connection between these people. It’s home. It’s familiarity. It’s companionship. The kitchen’s in the kitchen and the bathroom’s in the bathroom. And one of the roommates moving away for a few months isn’t going to change that. At least it hasn’t so far. If you detected a note of finality in that concluding paragraph, you weren’t off-base: After five seasons and 100-plus reviews, it’s time to pass the New Girl torch to another TV Club reviewer. I’ll still be watching when the show returns for season six, and I’ll make myself available for a guest review should the occasion arise, but I’d like to move on from the beat before I’ve officially run out of things to say about Jess, Nick, Schmidt, Winston, and Cece. The show and these reviews will always be close to my heart—it’s the longest TV Club assignment I’ve held, and one of the earliest I took on—and I can’t thank you enough for watching, reading, and commenting along with me four the last four-and-a-half years. Naturally, Robby’s romance with Nadia has turned him on to intimidating Eastern-European gangster fashions.